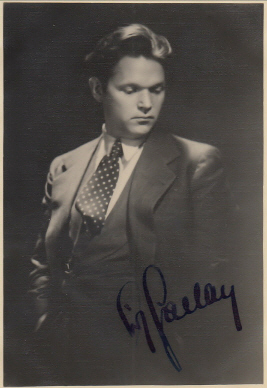 The actor and director Veit Harlan was and has been a very controversial person, not so much because of his movies as an actor but his movies as a director he created during World War II. They often had clear propagandist contents. Today Veit Harlan is connected to these movies by the majority but this would be a one-dimensional view of his work. Veit Harlan found out his interest into the acting in his school time and he began as an extra at the "Deutsches Theater". At the beginning of the 20's he got bigger parts at the theater and soon became established as an actor. He made his film debut with "Der Meister von Nürnberg" (27), it followed the movies "Die Hose" (27), "Somanmbul" (29) and "Es flüstert die Nacht" (29). In the sound film era he impersonated normally bigger support roles but he wasn't an actor star in the true sense of the word. He played among others in "Yorck" (31), "Friederike" (32), "Die unsichtbare Front" (32), "Flüchtlinge" (33), "Der rote Reiter" (35) and "Stradivari" (35). In 1935 he stopped acting and became a director. He made his debut with "Krach im Hinterhaus" (35). If followed melodramas like "Maria, die Magd" (36), "Jugend" (38) and "Verwehte Spuren" (38), where the actress Kristina Söderbaum played the leading roles. They got married in 1939 - it was Harlan's third marriage. Veit Harlan, who was a professed National Socialist since 1933, recommended himself to the propaganda ministry with his movie "Der Herrscher" (37). With "Jud Süss" (40) he created one of the most condemned propaganda movies, it followed "Der grosse König" (42) and "Kolberg" (45). Other well-known productions of these years were "Die goldene Stadt" (42), "Immensee" (43) and "Opfergang" (44). After the war Veit Harlan was exposed to a vehement critic because of his propaganda movies, a petition for denazification remained unfinished. It followed two trials because of "crime against humanity", but Veit Harlan acquitted in both cases. His first post-war movie "Unsterbliche Geliebte" (50) produced boycott calls, but with his following movies "Hanna Amon" (51) and "Die blaue Stunde" (53) he became established again. To his last cinematically works belong "Verrat an Deutschland" (54), "Anders als du und ich " (57) and "Liebe kann wie Gift sein" (58). Veit Harlan was married in second marriage with the actress Hilde Körber. His son Thomas Harlan became a director, his daughter Maria Körber an actress.